Mt. Hood Hideaway a Mountain Jewel, New,Clean and Best Rates. Tucked away in a quiet area, nestled into a hillside our beautiful mountain home is near 3 major SKI RESORTS, Hiking, Biking, Fishing, The Sandy River, Lakes, Wild wood recreation area and everything the mountain has to offer. Great dinning, shopping and Timberline Lodge. Relax after a day on the mountain at the cozy wood burning stove, feel right at home in this warmly designed cabin. Our custom designed cabin has 3 nice bedrooms with hardwood floors Comfortably sleeps 4-6 people. 2 full bathrooms with river rock floors, fully equipped kitchen, cozy living/dining area with a modern yet rustic feel. and a fire pit & awesome smoker grill outside. The Private deck behind the house is surrounded by forest and is very peaceful, a bird watchers paradise ! Hi We are the Bonfields, we built this beautiful home in 2008, it was truely a labor of love and it shows, we would love to share it with you and your family. We are sure you will love it as much as we do. Close to everything Mt. Hood has to offer, spotless clean and well appointed. We want you to remember this place and return again and again. Seasonal pool on the banks of the Sandy river. All wood provoded November - February. 2 comfy sofas and a nice log love seat. A ton of free movies. Drop in the Sandy river and shoot the rapids ! our private deck is surrouned by nature and super peaceful. Play tennis at the banks of the Sandy river. The resort at the mountain is a great place for golf and only 5 minutes away. Our private club pool is always a hit ! There is a two ( 2 ) night rental minimum for stays. RATE CHANGE EFFECTIVE 01/01/2019 VRBO no longer collects the 6% Clackamas CO. room tax, all rates include this tax and it will not be charged separately. VRBO will however still collect the 1.8 Oregon state hotel tax. Lovely log cabin for a great get away to a beautiful area. Very comfortable accommodations in a peaceful setting. Well set up! They had everything we needed. The price was fair and we got what we expected for the most part. A couple things cought me off guard though. I had to drag the trash cans to the curb! Don't mind taking the trash out but why am Is it my job to pack everyones trash from the past week to the curb? The cob webs need cleaned up in a bad way. but still a great place to stay overall. I stayed here with my family of 4 plus a family friend. It's a beautiful cabin tucked into a little mountain neighborhood. It snowed the whole time we were there and looking out all of the surrounding windows at the snowfall was everything. We originally had planned on staying here with 6 adults and our two kids, but my sister's family could not come last minute. It would have been cramped and even though we paid extra for more folks I'm glad we weren't all there. The main room itself is vaulted ceiling and open, with a fire going and the view it's exactly what you want from a snowy mountain getaway. After a day of snowboarding my boys were disappointed that the TV was too outdated to connect their switch game system to, but they survived 😉� It was also very cold/unheated when we first arrived, but with some fast work building a fire and turning the wall heaters on we warmed it up after an hour or two. It's really nice that they allow dogs and we had our small terrier with us. I'd stay here with my family again and recommend to others, very nice! We're sorry to hear about your family members not being able to make it but glad you enjoyed our place as much as we do, you are correct,that TV needs to be updated and I will do that asap 😁 please come again . We stayed in the Mt. Hood Hideaway last weekend and it was so perfect! 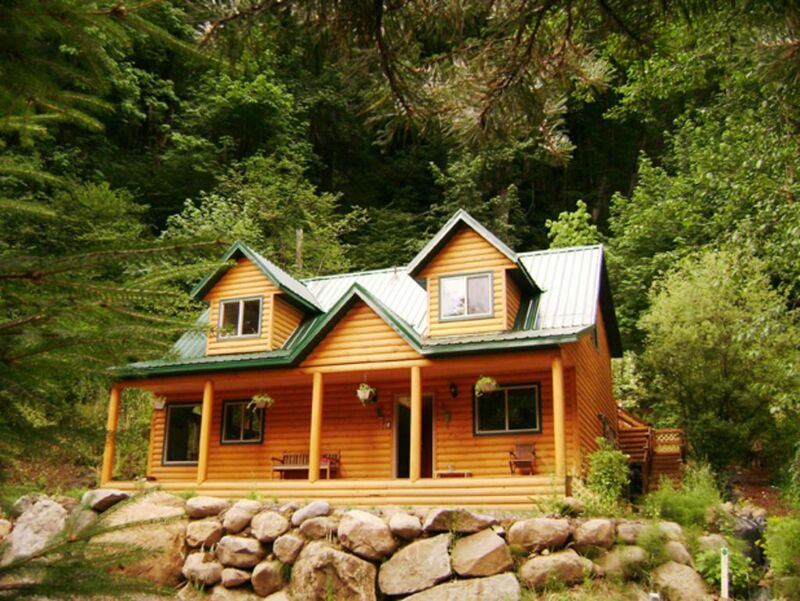 The pictures on the website really don't do this place justice - the cabin is so beautiful on the inside, very cozy and decorated with such taste. It was just the right amount of space for 4 adults and 4 kids. We would love to be back! I have to give all the design credit to my wife, she worked very hard to make the house as cozy as it is. Please come stay again. This was a comfortable and well-equipped small home close to the city, but convenient to Mt. Hood. There was plenty of room for our family of 4 and dog (very grateful to find a home which would allow a pet!). The rooms were clean and comfortable - beds were very soft, so if you need a firm bed be aware. Bathrooms were nice and there was plenty of hot water for showers after skiing. The kitchen was well equipped and we were able to cook 2 dinners and bake cookies with no problem.